12 Minute Payday Review – Is It A Scam? Welcome to my 12 Minute Payday Review – is it a scam or is it legit? Let’s find out! One thing I’m glad to say is that this one isn’t another binary options system! Everything I’ve seemed to be reviewing lately just seems to be binary options after binary options – I was getting fed up, nothing new & exciting seemed to be getting launched… Then came along 12 Minute Payday! So without further ado, what exactly is 12 Minute Payday & what’s all the fuss about? Basically if you send somebody straight over to a sales page then you’ve got a ridiculously low chance of them actually going on to make a purchase. It’s generally around 0.5% to 1% which is crazy. However if you capture their email address before you forward them onto the product then you have the ability to keep in contact with them and most importantly keep reintroducing them to the product that you’re offering. This is a fundamental part of internet marketing and it’s required to be successful. Just to put it into perspective an email list is said to be worth around $1 per subscriber per month, so if you had 1,000 subscribers you would expect to earn around $1,000 per month. Similarly if you had 10,000 subscribers then you would expect to earn $10,000 per month – crazy numbers! That’s not always the case though as it depends how actively engaged you are with your list – if you haven’t spoke to them for a while then chances are they won’t buy anything from you the next time you mail them. So more importantly can you make money with 12 Minute Payday? This is probably the main question you’re wondering, whether or not you can actually make any money with 12 Minute Payday. Was I right? 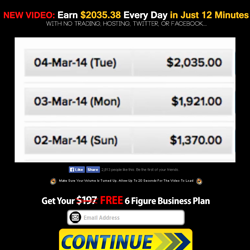 Well 12 Minute Payday makes some pretty bold claims that it can help you earn $2035.38 every day in just 12 minutes. To be honest that’s pretty ridiculous and although they’ve made the amount more precise to make it seem genuine, chances are it aint gonna happen. Basically all 12 Minute Payday seems to do is give you access to a whole load of landing pages that are supposed to convert. This doesn’t really seem to be anything new or exciting and I’m not sure why it’s gained so much hype – I think it’s just because it’s got an eye catching sales video. When I first came across this system I did have high hopes, it was apparently free according to the homepage – but then it later turns out that it’s not. What’s actually free on the homepage is the “6 figure business plan” which is nothing exciting whatsoever. It actually costs around $9 to get in but then you’re quickly upsold – there’s a few different levels at around $49 & $100 per month which seems pretty darn expensive just for some email capture pages. Everyone started slamming the system saying how bad it is & how they’ve lost money. It looks like the initial reviewers either hadn’t tried the product or were part of the company themselves. Since then every review I’ve came across has done nothing but mention how bad the system is, so I definitely won’t be trying it out for myself & I won’t be recommending it to anybody either. Despite this system not being binary options, and despite it looking promising upon first glance, this is nothing more than another “lose your money” system that doesn’t live up to it’s claims, or at least certainly not for the masses anyway. I don’t really like slamming systems like this because often people simply don’t put the required effort in & take it out on the system which means sometimes fantastic systems can get marked as scams, however in this case it looks like the system is at fault. Personally I won’t be using this and I won’t be recommending it to anybody either. Seems like it’s nothing but another internet marketer just looking to make a quick buck and build his/her email list at the same time. Now if you’re reading this after trying the system then I’d love to hear your thoughts. Is it actually as bad as I’ve made it sound or does it have some use? More importantly have you actually been able to make any money with it? Please leave a comment below, it’ll not only help me but it’ll help others who might also be considering using it. I hope you enjoyed reading my review, and I hope it helped you save yourself some money! Will The Automated Daily Income System Really Have You Making Money In Just 60 Minutes? Wealthy Agency Review – Jamie Lewis Reveals His New System But Is It a Scam? Is Paid Surveys At Home a Scam Site? My Review Uncovers The Truth About It! 9 Responses to "12 Minute Payday Review – Is It A Scam?" Just wanted to say thanks for your honest review! I am not easily fooled but I almost bit into this one but then decided to do some due diligence and found your review. Thanks so much!!! I signed up and got with a mentor. I was very excited as it seemed like a plausible business opportunity. I knew they would up-sell me, but I was okay with that …UNTIL… I was asked to invest $10,000! When I said I was not willing to invest that much I was told that without a 10k investment I would not make it. Then when I said I was sorry but I was still not willing to do that, I was told to apologize to my kid and I hung up. So obviously the original video/sales pitch is a lie. DONT DO IT unless you have that kind of money to risk. Get real, the only way to make money online, create your own product and sell that, be the head not the tail, all the other scams want your money and give you nothing. I saw this video in my 14 year old daughter’s inbox. I’m concerned that they will capture anyone’s email address. I watched parts of the video as it was 29 minutes and found your site after searching for 12 minute payday scam. I will not proceed with this but will use your link and research the others. Thanks.